Post production plug - left. 'Hutchinson' Enhanced Script and address, black at ss. Clear with yellow rail overlap, with foil laminated volan half deck and tail patches, Green resin pinlines. Robbie Hutchinson currently shapes for Bear Surfboards and others. Purhased Play It Again Sam Sports P/l Miranda NSW. 1 August 1996. Minor repairs, legrope plug removed, a mistake. If the plug is in a clear board, leave it. If it can be covered by colour, fill the plug with Q-cells or foam and glass over it. 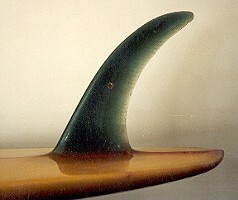 A nice example of a North coast speed board design of the period, the laminated deck/tail patches and the colour work are typical of the company's reputation for a quality board. 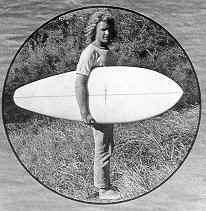 in Surfing World magazine Vol 14 Number 1 1973 pages 50 - 53. CONDITION: 7 - bloched legrope plug removal. Surfing World magazine Vol 15 Number 3 1971?? page?